We’re going to move again! Unfortunately, it is about time again: We’re moving. We had a really nice time in our neighborhood – it’s close to the city center, but still quiet. Unfortunately, it now is too small for us, and storing books in the basement is not really ideal. Whenever we get deliveries from larger trucks, it’s a problem due to the narrow streets. But apart from that we had a lot of difficulties here in recent years, which we would like to leave behind (not to mention the water in the cellar right now …). Due to the continuous growth in the roots of compassion hearquarters, we need more space, but we’ve been searching for a nice spot for a while with no success. So: Industrial area. A more rational decision, which might not be such a nice working atmosphere and it means even longer bike and bus routes for many of us. So, as of August 15th, 2014 roots of compassion has a new address! 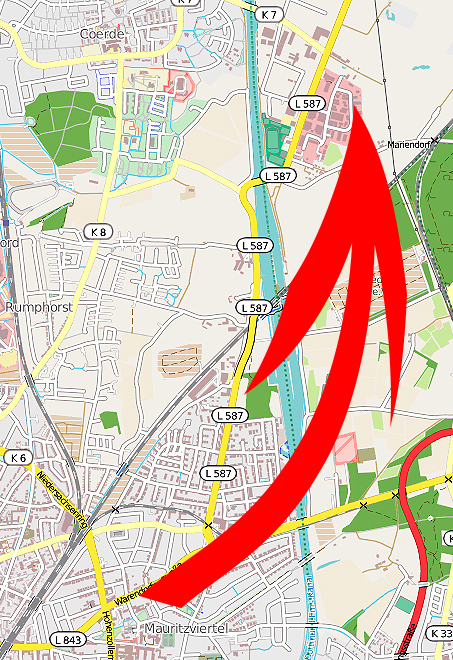 You will find us in the Rudolf-Diesel-Straße 37, 48157 Münster. Please understand that therefore we will not process or ship any orders on August 15th, 2014! But shortly after things should be back to normal again … Thank you for your understanding! As you can imagine, we prefer to ship boxes instead of carrying them. So we have a special sale coming up this weekend. From August 1st till the 3rd you can get a discount on a lot of items, such as shirts, shoes, belts, patches, stickers and buttons. Help us clear our shelves, so we have to carry less stuff to our new HQ and we can finish the move early! Thanks! Previous Previous post: Rainstorm in Muenster!